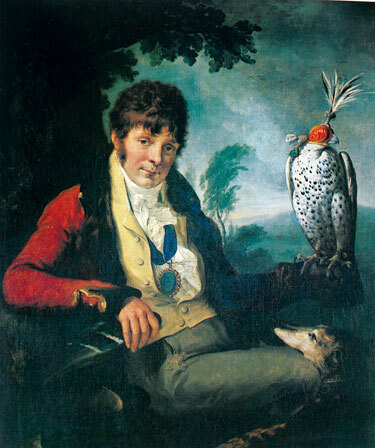 Colonel Thomas Thornton was perhaps the most flamboyant sportsman and falconer of Britain's 18th century. The stories of his sporting exploits are legend and chronicled in his books of his sojourns to Scotland, England and France. He died penniless and most of his estate was sold in his latter years leaving very few physical items for the public to view. His famed house Thornville Royal was torn down several years after he sold it and very little evidence remains in Yorkshire where he once lived. 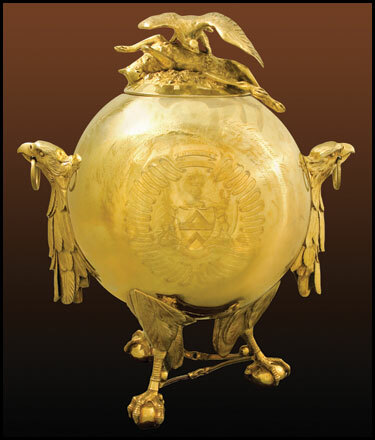 For falconers, the most famous piece of his falconry ephemera is a silver-gilt tea urn presented to him in 1781 by the members of The Confederate Hawks of Great Britain, which he founded and managed for nine years. It was last seen by the public at an exhibition of sporting Art at the London's Grosvenor Gallery in 1890. The urn was held in the estate of the Earl of Orford until its recent acquisition and generous donation to our Archives by Patrons Bob and Carol Berry. The Urn is on display at The Archives together with several of his art works and publications.